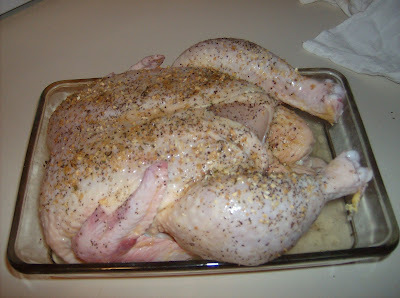 The chicken is successfully in the oven and really it wasn't that bad! The part that I was dreading, taking the bag of chicken parts out of the chicken was really no big deal. Everything was contained in a neat plastic bag. No fuss no muss! Before I opened the chicken, I called mom because I was sure I would need assistance but I really didn't. I took the bag out, rinsed the chicken a little and put it in a pan with some water. I sprinkled some spices (pepper, salt, garlic and a chicken seasoning blend) inside the chicken and all around the outside and put it in the oven. The package even said what temp and how long to cook it! It also said to tie the feet together but Mom said I did not have to and Mom trumps package. It also doesn't need to cook nearly as long as I thought, only an hour and 10 minutes (according to the package), I'm assuming it's because this is a fairly small chicken at about 6lbs. I told mom when I go home for Thanksgiving, we're making a turkey together! She laughed. We'll see. On that note, I need to go and baste it a little!